What is the camera calibration? 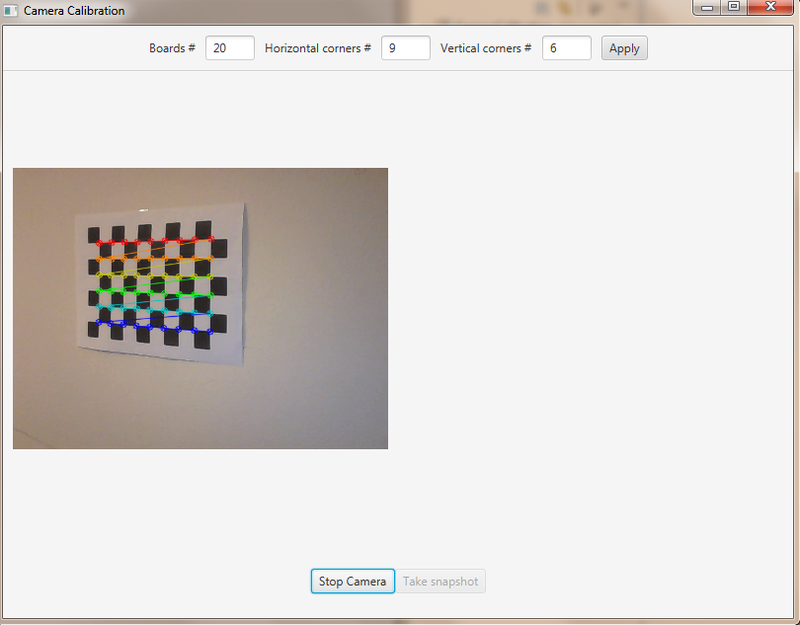 This tutorial is not updated to OpenCV 3.0. The goal of this tutorial is to learn how to calibrate a camera given a set of chessboard images. The camera calibration is the process with which we can obtain the camera parameters such as intrinsic and extrinsic parameters, distortions and so on. The calibration of the camera is often necessary when the alignment between the lens and the optic sensors chip is not correct; the effect produced by this wrong alignment is usually more visible in low quality cameras. As we said earlier we are going to need some sort of pattern that the program can recognize in order to make the calibration work. 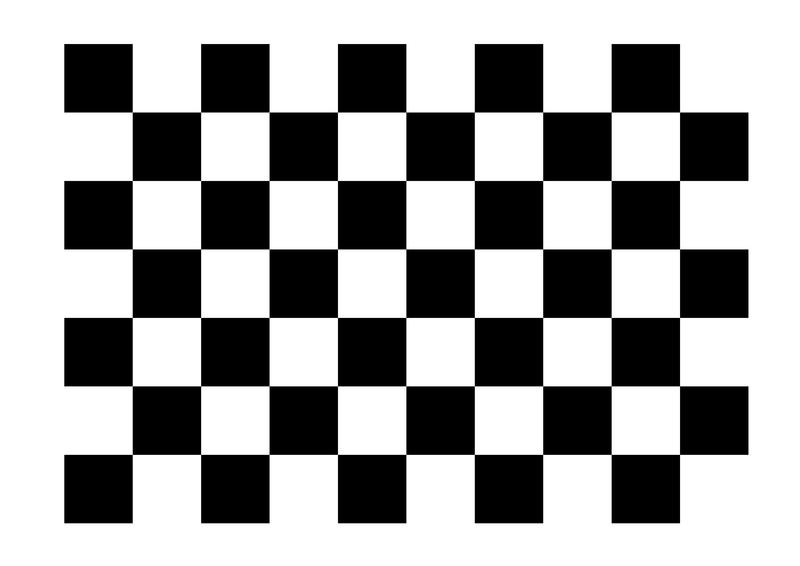 The pattern that we are going to use is a chessboard image. The reason why we use this image is because there are some OpenCV functions that can recognize this pattern and draw a scheme which highlights the intersections between each block. To make the calibration work you need to print the chessboard image and show it to the cam; it is important to maintain the sheet still, better if stick to a surface. In order to make a good calibration, we need to have about 20 samples of the pattern taken from different angles and distances. Calibrate and show the video stream. on TOP we need to have the possibility to set the number of samples for the calibration, the number of horizontal corners we have in the test image, the number of vertical corners we have in the test image and a button to update this data. To make things cleaner let’s put all these elements inside a HBox. Let’s also add some labels before each text fields. Each text field is going to need an id, and let’s put a standard value for them already. 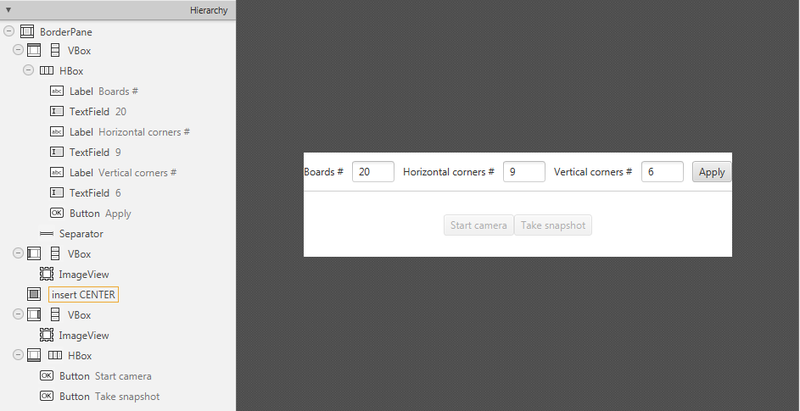 on the LEFT add an ImageView inside a VBox for the normal cam stream; set an id for it. on the RIGHT add an ImageView inside a VBox for the calibrated cam stream; set an id for it. in the BOTTOM add a start/stop cam stream button and a snapshot button inside a HBox; set an id and a action method for each one. image Source chessboard view. It must be an 8-bit grayscale or color image. corners Output array of detected corners. CV_CALIB_CB_ADAPTIVE_THRESH Use adaptive thresholding to convert the image to black and white, rather than a fixed threshold level (computed from the average image brightness). CV_CALIB_CB_NORMALIZE_IMAGE Normalize the image gamma with “equalizeHist” before applying fixed or adaptive thresholding. CV_CALIB_CB_FILTER_QUADS Use additional criteria (like contour area, perimeter, square-like shape) to filter out false quads extracted at the contour retrieval stage. CALIB_CB_FAST_CHECK Run a fast check on the image that looks for chessboard corners, and shortcut the call if none is found. This can drastically speed up the call in the degenerate condition when no chessboard is observed. If the recognition went well found should be true. For square images the positions of the corners are only approximate. We may improve this by calling the cornerSubPix function. It will produce better calibration result. The function draws individual chessboard corners detected either as red circles if the board was not found, or as colored corners connected with lines if the board was found. image Destination image. It must be an 8-bit color image. patternSize Number of inner corners per a chessboard row and column. corners Array of detected corners, the output of findChessboardCorners. patternWasFound Parameter indicating whether the complete board was found or not. The return value of findChessboardCorners should be passed here. Now we can activate the Snapshot button to save the data. We should take the set number of “snapshots” from different angles and depth, in order to make the calibration. We don’t actually save the image but just the data we need. Otherwise we can calibrate the camera. objectPoints In the new interface it is a vector of vectors of calibration pattern points in the calibration pattern coordinate space. The outer vector contains as many elements as the number of the pattern views. The points are 3D, but since they are in a pattern coordinate system, then, if the rig is planar, it may make sense to put the model to a XY coordinate plane so that Z-coordinate of each input object point is 0.
imagePoints It is a vector of vectors of the projections of calibration pattern points. imageSize Size of the image used only to initialize the intrinsic camera matrix. 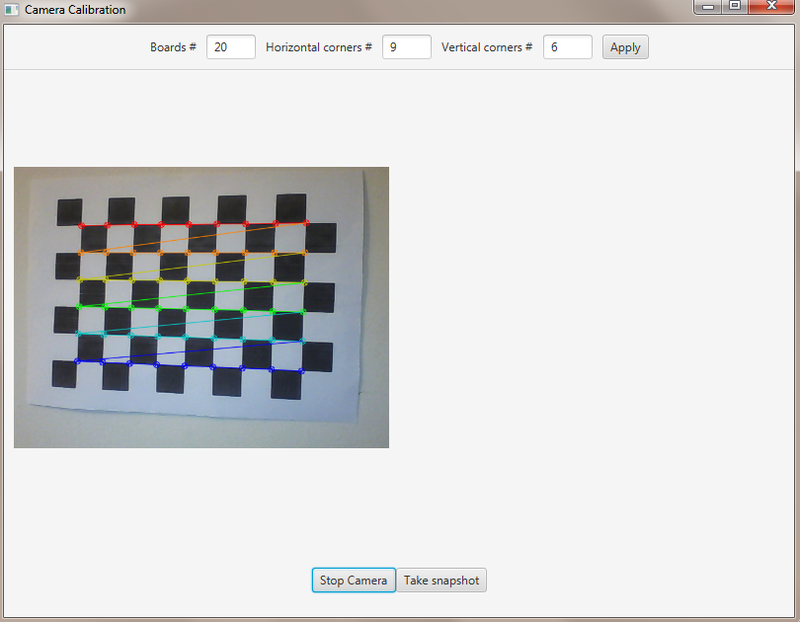 cameraMatrix Output 3x3 floating-point camera matrix A = |fx 0 cx| |0 fy cy| |0 0 1|. If CV_CALIB_USE_INTRINSIC_GUESS and/or CV_CALIB_FIX_ASPECT_RATIO are specified, some or all of fx, fy, cx, cy must be initialized before calling the function. distCoeffs Output vector of distortion coefficients of 4, 5, or 8 elements. rvecs Output vector of rotation vectors estimated for each pattern view. That is, each k-th rotation vector together with the corresponding k-th translation vector. tvecs Output vector of translation vectors estimated for each pattern view. The undistort function transforms an image to compensate radial and tangential lens distortion. The source code of the entire tutorial is available on GitHub. © Copyright 2014-2016, Luigi De Russis, Alberto Sacco. Revision f734e31f.